• Spanish morphology module to translate words in any grammatical form. • Spanish audio pronunciations recorded by native speakers to master your spoken language skills. 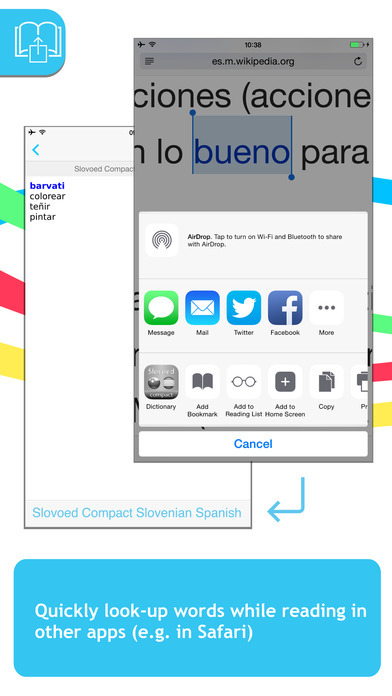 • Full linguistic information – with declension and conjugation tables – is included, making Slovoed a must-have for any language scholar of Spanish. New for iOS 9: You can now look up words while reading news, email, Safari sites, messaging or other popular apps! 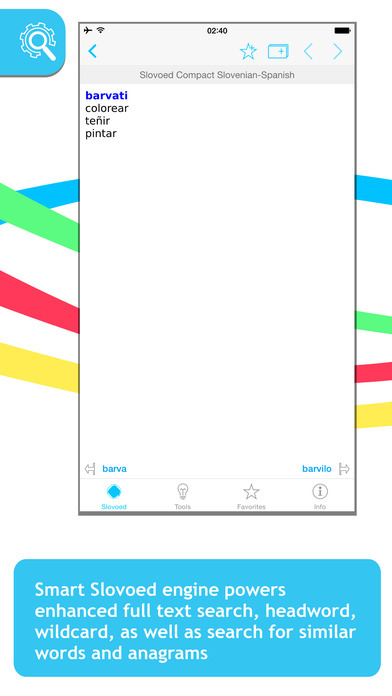 Select any text and send it to the dictionary via the “Share” button. All words available in the dictionary will be highlighted. To activate this feature, please select Slovoed as a sharing 'extension'. New multiple clipboard look-up! You can now copy as many words as you need while reading – even the whole text, - switch back to Slovoed app and view all the relevant dictionary entries one-by-one. New! Graphics fully adapted for iPhone 6 and iPhone 6 Plus. New! App startup has got 3 times faster!